I’m a long time from leaving the company I started. There are problems to solve, things to learn, and new opportunities every day. Atomic Object is still very much my “hell, yeah”. But after reading Bo Burlingham’s latest book, “Finish Big”, I have taken to heart an important lesson for founders: when it comes to your exit, start early. “Finish Big” shares what Bo learned from doing more than a 100 interviews with founders who have exited the company they started. He found clear patterns that differentiated those who were happy with their exit from those who were unhappy or left with regrets. “Finish Big” is an important book that I’ve strongly recommended to many people. 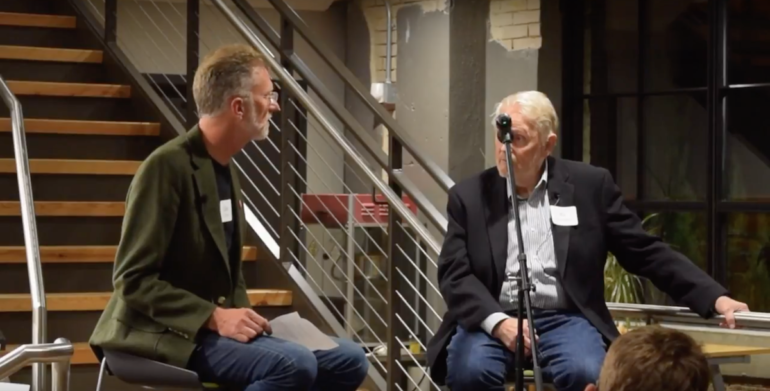 Atomic recently hosted Bo—long-time editor at Inc magazine, author of several books on business, a contributor to Forbes magazine and a co-founder of the Small Giants Community—to share the lessons from “Finish Big” with our Grand Rapids community. Bo is also the author of “Small Giants,” a book that tells the stories of companies that have chosen to be great instead of big. Atomic was five years old when I read “Small Giants”. I was a college professor who had become an entrepreneur. I really appreciated the validation I felt knowing that there were successful companies who didn’t buy into the “growth as goal” idea that is so prevalent. “Finish Big” was as insightful to me personally as “Small Giants” was useful and insightful for Atomic. The video and transcript below is an edited version of my interview with Bo when he presented in our Grand Rapids office. Thanks to Elaine Ezekiel for surfacing the most important points of a one hour interview. Bo Burlingham: I had to define what a good exit was, and I came up with, as you say, four things—or five. Carl: Four plus one is the way I think about it. Bo: That’s right, four plus one. The first one was that people had gone through the process and felt the process was fair, and that they had received an appropriate amount of money for what they’d put into the business. The second characteristic of a good exit—which was really allowed by the first one—was that they could look back on what they’d done and feel a sense of pride knowing that they had built something and contributed something of value to the world. The third quality had to do with the other people who’d been on the journey with them, and that they felt at peace with what had happened to those people. That was going to be different for different people, obviously. It was important that they’d be at peace with whatever it was. The fourth one was that they had figured out what they were going to do next and had become engaged in that. And for some people, there was a fifth one. This one wasn’t true for everyone, but it was true for a lot of people. It was that the company was going on—and in fact doing better than ever—which was really an affirmation that they had done a good job on one of the most difficult transitions that any business has to go through. That was the fifth factor. Carl: Before I read your book, I thought about “the exit” as some kind thing where I sign a piece of paper, and I get a check, and then “I’m done.” Like a really narrow window of time. Bo: Well I thought that, too. You know, as long as I’d been at Inc., I thought “Well the exit’s something that happens at the end, and it’s an event.” But as I really went in and interviewed people, I realized that that was the wrong way to look at it that. In fact, the exit is a phase of the business. You have the startup phase, you have the growth phase, you have the mature phase, and you have the exit phase. There are actually four stages to the exist phase—or there should be four stages to it. The first stage is sort of the educational one where you’re basically just teaching yourself—learning—what are the possibilities? What could it be? Which one would you prefer? The second one is the strategic phase. That’s the stage where you’re building the company, and you’re building into it the qualities that are going to allow you to have the kind of exit you want. The third phase is the one that most people think of as “the exit.” That begins when you call up your lawyer, your accountant, or you call up a broker or investment banker, and say “Okay, I’m ready to sell. Can you find me a buyer?” That stage ends with the deal. As far as all those other people are concerned, that’s it—it’s the check, you know? They get paid, and they go on and do something else. But that’s not the end for the entrepreneur, and this was key, because a lot of people don’t realize this. In fact, there’s a fourth stage, which is the transition from being the owner of a business, and being the head of the company, and somebody whom other people look up to and rely on for guidance—you go from that to being somebody whose phone calls don’t get returned. That can be a tremendously difficult period to go through. Carl: In the book, you give seven areas of advice for exiting entrepreneurs. I really liked the one that you talked about first, which was “start with knowing yourself,” in a nutshell. Can you talk about that one a little bit? Bo: Yeah, the same thing was true with “Small Giants” actually; the first characteristics that I found with the people who built “Small Giants” was they knew who they were, they knew what they wanted, and they knew why they wanted it. That’s not the sort of thing you go off for a weekend and figure it out. Most of us spend our entire lives trying to figure that out. Oftentimes, it takes very difficult experiences to find out an awful lot about ourselves. The people who know that have a much better chance of making decisions that they’re going to be happy with later on. If you don’t know that, you wind up doing what other people think you should do. And particularly when you go to sell your company, or move on in some way, everybody’s going to have an opinion about what you should do. They’ll be advising you about this, that, or the other thing, and it might or it might not be right to you. The fact of the matter is that if you don’t know that before you do the deal, you’re going to run smack into it after you do the deal. One of the first questions that comes up is, “Who am I? What’s my purpose here? What’s my identity?” and a lot of people have to really struggle with that. Carl: Give yourself time is another one of these seven, and I have to ask, how much time? When do successful exits start? Bo: Basically, when you look at the way that the exit process should go if you’re conscious about it—namely that there’s this first period—the exploratory phase when you’re figuring out what’s involved. It’s never too early to start that—never. I personally think that people are well-advised to begin thinking about that as early as they think about going into business, frankly. It’s certainly something that they should be thinking about after they get into business, because it’s very easy—and frequently happens—that people wind up making decisions in the early days of a business—or in the course of growing the business—that are going to severely restrict the choices that they’re going to have at the end—particularly when it comes to equity. When you’re building a business, you’re often strapped and sort of worried about whether you’re going to have enough money or pull off whatever plan it is and make payroll, and so forth. It’s very tempting to give in to anybody who comes along offering you money, but the money always comes with strings attached. If you’re not really aware of what those strings are, you can wind up in a situation where it’ll be very sad. Carl: One of the things that you write about “giving yourself time” is the ability to correct a mistake in a succession decision. I found the stats on this depressing as hell—about how many people don’t get it right the first time. Bo: Of all the companies I interviewed, there was one person who got it right the first time. Carl: One. Out of a hundred plus. Bo: Yeah. I should add that you know not everybody I interviewed really needed a successor. They wound up selling to another company, which sort of absorbed them. If the kind of exit that you want involves having a successor, people frequently make a lot of mistakes. That’s just the way it is. Carl: Your seventh bit of advice, which is “knowing what comes next,” I think that’s about being pulled out by something new, rather than merely stopping something you’ve done for years, and I’d love you to talk more about that. Bo: It’s very difficult, as you can imagine, when you’re engaged in something that you enjoy doing, to imagine what life is going to be like afterwards. It really involves visioning, which is the spécialité of Zingerman’s, and it’s still very hard. They lose that sense of identity; they lose the sense of purpose; they lose their tribe—people they’ve been hanging out with for years. They lose the structure that comes from business. Business is great, because it tells you what you need to do next, and they lose a sort of sense of accomplishment. Another thing about business: it’s great in that it tells you how you’re doing, and it tells you what you’re accomplishing. Suddenly, you don’t have any of that, and people feel lost. That’s what they all say—they feel lost, and they’re asking themselves, “Who am I? What am I doing? Where do I go from here?” That can be profoundly depressing. I thought about it, and it was interesting, because when I looked at the people who’d had good exits, they often went through a rocky period at the beginning. Eventually what they wound up doing—a huge number of them—was helping other entrepreneurs, going into a business where they get paid to help entrepreneurs go through this process, or go through building their companies. What are they doing? They’re serving. We say “purposeful.” What are we talking about? We’re really talking about who are you serving. In business, at the very least, you’re probably serving your family, you’re going to be serving your customers. If you aren’t serving your customers, you’re not going to be in business very long. A lot of people are serving their employees as well. There’s Atomic, serving their community. For a lot of people, what they’re losing is that sense of service—of who they’re serving. They’re just out there, and it’s like, “Wait a minute, what am I doing? Who am I?” I think that that’s really critical for people to think about beforehand. Carl: Bo, thank you so much for writing “Small Giants” and inspiring us at Atomic and then for “Finish Big” for inspiring me personally. Thanks very much.